The Prime Minister, Voreqe Bainimarama, yesterday showed his love for children while calling on the people of Fiji to be vigilant in looking after their young ones. 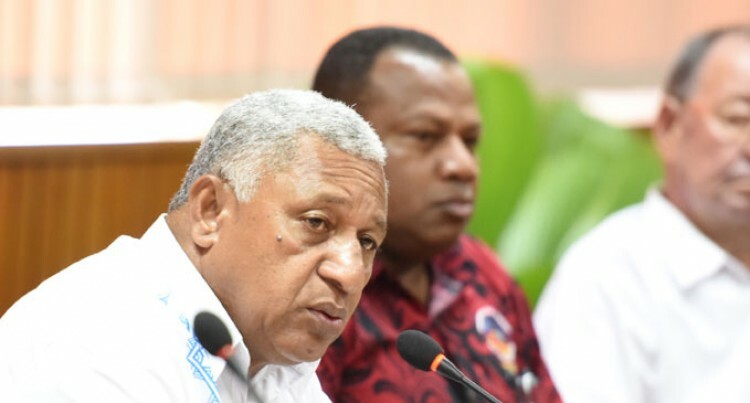 Mr Bainimarama called on members of the public to be extremely careful during the wet weather brought about by Tropical Cyclone Pam. He specifically made a special call to parents and guardians that they should take care at all times. Water Safety Council figures released yesterday said 77 per cent of the total drowning in Fiji last year occurred during the cyclone season. “More than half of the 47 drowning victims last year were under the age of 25, with children aged between one and five years old accounting for 23 per cent of those drowning. “The loss of these most vulnerable and innocent children among us was a particular tragedy. We need to be a lot more vigilant. A lot more alert. He urged parents to equip their children with the skills they needed to get out of trouble. The Prime Minister paid tribute to the Water Safety Council of Fiji for its work and to the members of the Fiji Police Force for their efforts for the safety for every Fijian.